Garuda Type silver drachma. 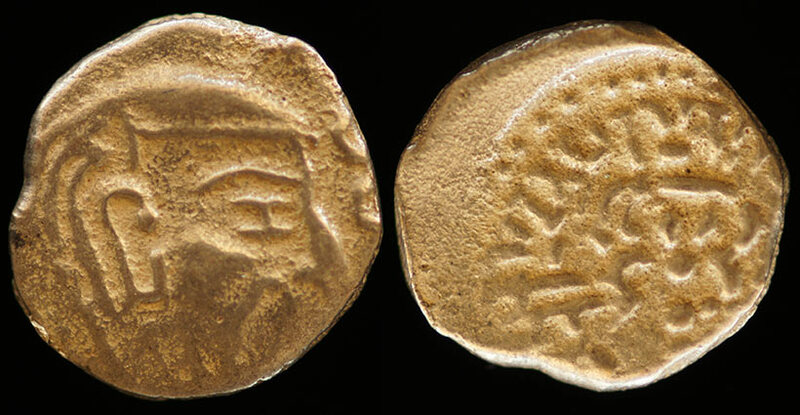 455 - 467 A.D. Obverse head of king r. with date behind (?). Rx: stylized Garuda standing, facing l. w/wings spread - Brahmi legend (paramabh&#257;gavata maharajadhiraja sri skandagupta kramaditya) around; design is up-side down in photo. The Garuda type of silver coins of Skandagupta continued the series of coins issued by Chandragupta II and Kumaragupta I which were based on Western Kshatrapa prototypes. On this coin, the sun above the Garuda figure is to the left.